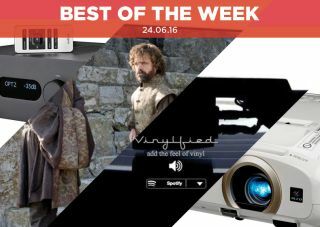 Best of the Week: Audiolab M-DAC+, Epson budget projector, Sonos update and more | What Hi-Fi? A round-up of stories to have featured in What Hi-Fi? this week, including news of an update for the Sonos Controller, Audiolab's M-ONE integrated amp/DAC and reviews of LG's latest OLED TV and an Epson projector. This week Sonos issued an update for its Sonos Controller software, Audiolab officially launched its M-ONE integrated amplifier with built-in DAC and website Vinlyfied come up with a novel way of merging the worlds of vinyl and music streaming. A new update for the Sonos Controller includes a more simplified set-up process for Sonos Trueplay and better audio on Napster and Rhapsody music services, which will now benefit from higher bitrates. The update is available now on both Android and iOS platforms. The M-ONE is Audiolab's latest integrated amplifier and can function as a DAC and headphone amp, with Bluetooth streaming included too. There's support for DSD files up to DSD256 as well as hi-res audio up to 32-bit/384kHz. Miss the hiss and scratchings of a vinyl record? Vinylfied has stepped in and offered listeners the chance to stream music from the likes of Spotify with added hiss. Yes, really. You can hear whether it's any good by visiting Vinlyfied's site. "The Audiolab M-DAC+ gets an awful lot right – so much, in fact, it comfortably justifies its ‘+’ designation"
The M-DAC+ replaces a longtime favourite of ours, the M-DAC, and does so with aplomb. The 'Plus' name is merited whether it's the build quality of the smart, compact casework or the features included within it. Sound quality is up there with the best. Our only issue is that it could use a touch more attack, but that's just nitpicking. "It has everything we want: a stunning picture, gorgeous design, great sound, and one eye on the horizon"
LG is on a great run with its current range of OLED TVs, and the OLED65G6V boasts a stunning picture, great design and impressive sound. The £6000 price is the only black mark against it, as the LG OLED65E6V offers the same picture performance for a £1000 less. It's nonetheless an impressive statement from the South Korean manufacturer. "If you’re keen to get the big screen experience for under £500, you could just find the Epson EH-TW5300 scratches that itch"
This budget projector from Epson offers a big picture without draining your bank account. Some aspects, such as black levels, detail and picture noise could be better, but the tradeoff is a bright picture, well judged colours and its £500 price.